Perfect Pumpkin Pollinators: The Squash Bees! Pumpkin pie and various squashes. 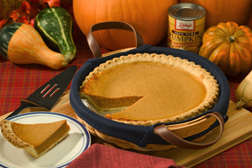 Sweet, smooth, and spicy, it’s no wonder that pumpkin pie is a holiday favorite, year after year. But the rotund pumpkins from which the delicious pie filling is made will only form when the plants’ showy, yellow-orange blossoms are pollinated. Fortunately, native bees of the genera Peponapis and Xenoglossa are excellent pumpkin patch pollinators. Apparently, they’re also proficient pollinators of pumpkin’s many cucurbit relatives, including gourds and squash—spaghetti, pattypan, butternut, Hubbard, and zucchini. ARS entomologists Jim Cane, Frank Eischen, and Blair Sampson are enthusiastic boosters of the so-called squash and gourd bees—about 20 wild, indigenous North, Central, and South American species in all. Cane says these unobtrusive, hardworking bees are early risers—already at work before sunrise, when squash blossoms are just beginning to open. Honey bees, bumble bees, and other pollinating insects won’t begin showing up until at least half an hour later, according to Cane. He’s based at the agency’s Pollinating Insects Biology, Management, and Systematics Research Unit in Logan, Utah. Squash bees’ underground nests—typically tunneled a foot or so beneath the surface—are much less noticeable than the aboveground homes of other bees, he points out. That might help explain why even the people who grow pumpkins for fun or for profit may be oblivious to the busy squash bees. Both male and female squash bees take up the blooms’ sweet nectar. But only the females seek the orange pollen grains, munching on or carrying the grains and nectar back to their nests as provisions for their offspring. Back at the pumpkin patch, the blooms will have closed by midday, and squash bees will have all but disappeared from view. The wiliest of the males will be spending the rest of their day—and night—sleeping peacefully in a flower. The next morning, these plan-ahead Romeos will be fully refreshed and ready to romance unsuspecting females that begin to arrive as soon as flowers open. In recent studies, Cane and colleagues have provided new details about the bees’ habits and prevalence. New information suggests that these specialty bees handle a hefty share of the pumpkin, squash, and gourd pollination workload in most of the United States. The bees’ pollination skills are good news for backyard gardeners and commercial growers, especially in light of the problems plaguing America’s best-known pollinator, the European honey bee, Apis mellifera. Honey bee colonies have been hit hard by a growing list of woes, including the mostly mysterious colony collapse disorder, as well as the troubles brought on by beetles, mites, Africanized honey bees, diseases, and pesticides. Squash bee research by the three ARS scientists expands on pioneering studies by entomologist Vince Tepedino, now retired from the Logan lab but continuing to work with the team as a collaborator. 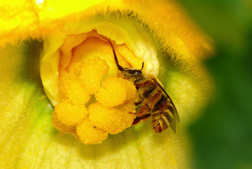 Tepedino’s investigation in a Utah zucchini field, for example, provided evidence that strong populations of squash bees such as P. pruinosa can handle squash-pollination assignments without help from honey bees. The wild bees would thus free up the increasingly scarce, in-demand honey bees for work elsewhere. One of the factors that might explain the male P. pruinosa bee’s surprisingly significant role is his choice of where to patrol for females. Unlike some male bees that mainly look for females at nest sites, P. pruinosa males “avidly visit flowers,” says Cane. The census is the first hemisphere-scale survey of its kind ever developed for a nonsocial (that is, not living in a hive or other colony) bee. Made possible in part by the ease of communicating via the Internet, the survey will enable collaborators to develop a science-based, statistically sound overview of the presence and pollination prowess of squash and gourd bees of the New World. The study’s protocol, tested and fine-tuned by Cane and collaborators, has already been adapted by the Food and Agriculture Organization of the United Nations as a model for investigations of native crop-pollinating insects elsewhere. As their time permits, participants provide data about the number and kinds of pollinators that visit squash or gourd blossoms at the selected sites. These statistically sound “snapshots” take about 10 to 20 minutes to complete and can be made anytime during the growing season, Cane says. At the Honey Bee Research Unit in Weslaco, Texas, Frank Eischen has been collecting data for the survey for the past 3 years. Along with technician Henry Graham, Eischen is monitoring Peponapis and honey bees on early plantings of squash in the Rio Grande Valley of Texas. In the southeastern United States, colleague Blair Sampson scrutinized blossoms of pumpkin, crookneck, straight neck, Lakota, and zucchini squash at one of the ARS Southern Horticultural Laboratory field sites in Poplarville, Mississippi, and in nearby McNeil. “Preliminary data from our observations—mainly of P. pruinosa and X. strenua—suggest that wild squash and gourd bees have all five of the traits ascribed to the world’s most efficient crop pollinators: They’re abundant, competitive, efficient, faithful in their choice of crop, and fast,” says Sampson. • Locations that have a history of pumpkin, squash, or gourd cultivation are typically continuing to host thriving Peponapis populations. • Some conventionally managed farms that use pesticides judiciously on squash or other crops nearby nonetheless have an abundance of Peponapis bees. • Even in extensive plantings, populations of squash and gourd bees remain high, unlike some wild bee densities that tend to thin out as field size increases. In fact, squash bees may “prove to be the most important floral specialists in agriculture in the Americas,” he says. The squash and gourd bee studies help ensure that the needs of these talented pollinators are fully understood and met.—By Marcia Wood, Agricultural Research Service Information Staff. Alfredo Flores, ARS, contributed to this article. This research is part of Crop Production, an ARS national program (#305) described on the World Wide Web at www.nps.ars.usda.gov. James H. Cane is in the USDA-ARS Pollinating Insects Biology, Management, and Systematics Research Unit, 5310 Old Main Hill Rd., Logan, UT 84322; phone (435) 797-3879, fax (435) 797-0461. Frank A. Eischen is in the USDA-ARS Honey Bee Research Unit, Kika de la Garza Subtropical Agricultural Research Center, 2413 E. Hwy. 83, #213, Weslaco, TX 78596; phone (956) 969-5007, fax (956) 969-5033. Blair J. Sampson is with the USDA-ARS Southern Horticultural Laboratory, 810 Hwy. 26 W., P.O. Box 287, Poplarville, MS 39470; phone (601) 403-8765, fax (601) 795-4965. "Perfect Pumpkin Pollinators: The Squash Bees!" was published in the November/December 2008 issue of Agricultural Research magazine.